Not that I am pandering or anything (cough) – but I actually got a request today that I could actually fulfill. 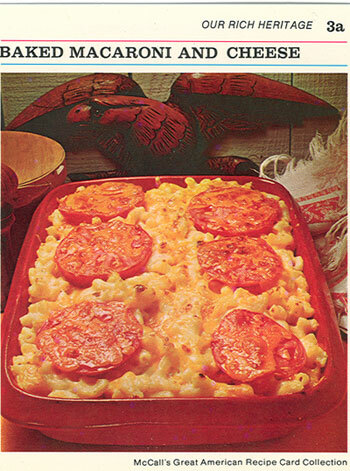 A request for McCalls Baked Macaroni & Cheese from the wonderful and frightening McCall’s Great American Recipe Collection. Anything for a reader, and of course, another aficionado of the sublime wonderfulness of that which we call Macaroni & Cheese. Preheat oven to 375F. Cook macaroni according to package directions; drain. Meanwhile, melt butter in medium saucepan. Remove from heat. Stir in flour, salt and pepper until smooth. Gradually stir in milk. Bring to boiling, stirring. Reduce heat, and simmer mixture for one minute. Remove from heat. Stir in 1 1/2 cups of cheese and macaroni. Pour into a 1 1/2 quart shallow casserole dish. Arange tomato slices over top. Sprinkle remaining cheese. Bake 15 minutes until cheese is golden brown. ← Ad o’ the Day: ??? McCalls recipe card and thrilled to find it again! Loved this cookbook, don’t know who in my family has mother’s copy! This is MY POST!!!! Yes Jeff its YOU im talking about! !